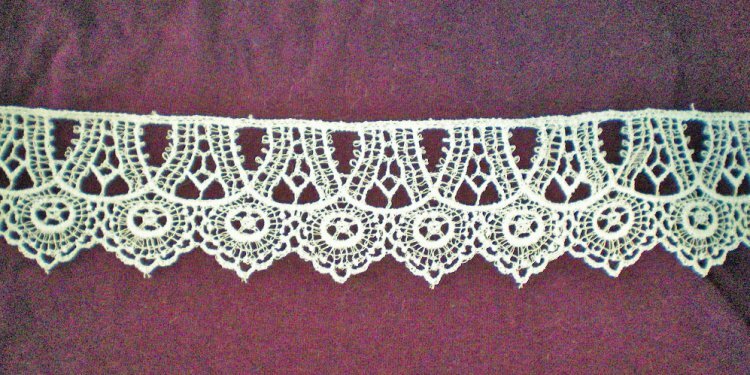 The wholesale Venice lace trim for sale at Lace Heaven can take any piece of clothing or craft from plain and simple to intricate and beautiful. Unlike other laces, Venice lace is made from needlepoint instead of embroidery, which means that it usually has a higher profile than embroidered lace, and it can be simple or stunningly intricate. The Venice lace can have a slightly different texture than embroidered lace, which makes it stand out on nearly any piece of cloth. Unsurprisingly, Venice lace was originally created in Italy in the Middle Ages. At the time, Italy was the fashion capital of Europe, and the English and French nobility jumped on the new, lace patterns coming out of Italy. Today, Venice lace can be used on just about any lace project, and you do not have to be anywhere near nobility to use it. The Venice trim for sale at Lace Heaven is a high-quality lace, but with our discount, wholesale pricing, you can get a great deal on the trim you need for your next project. From baby blankets to wedding dresses, a trim of Venice lace can make a piece special for anyone. We have hundreds of types of Venice lace trim for sale, with many trims available in a full spectrum of different color varieties to complement the colors of your shirt, blanket or other fabric project.